Since I can’t fight this craving I made myself some juicy and delicious pork chops with an apple cider glaze that is literally to-die-for. These are really delicious and they have none of that cardboard effect I cannot and will not get past in a pork chop. Perfectly juicy with a caramelized and flavorful glaze, and just a bit of heat that will make you come for more. I just had them and I can’t stop thinking how good they are. I think you’ll be impressed too. Bowled over, even. 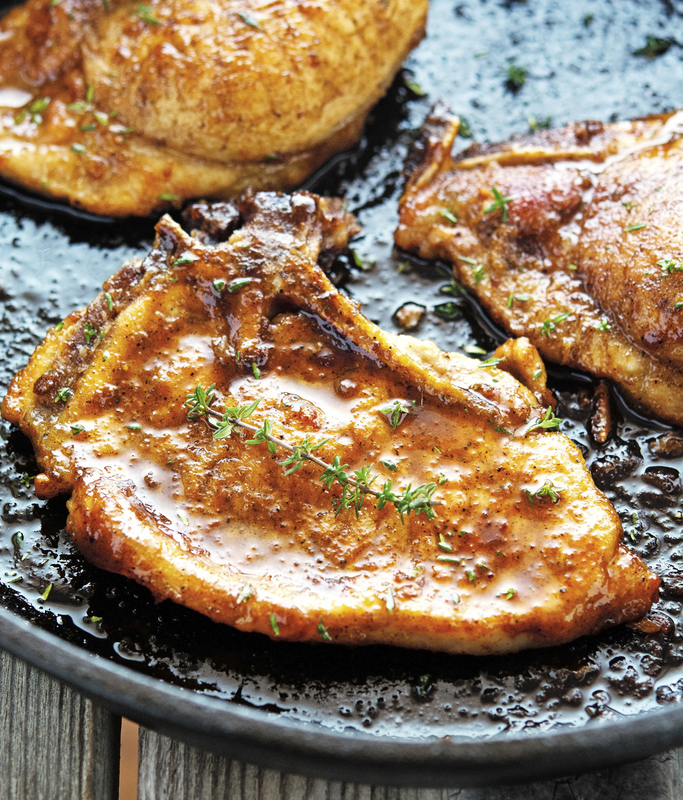 Apple Cider Glazed Pork Chops Print this recipe! In a small saucepan combine apple cider, maple syrup, Dijon mustard, and red pepper flakes. Bring to a boil over medium heat, reduce to a simmer, and cook until reduced and thickened — at least 10 to 15 minutes. In a small bowl combine sugar, chili powder, garlic powder, 1 teaspoon of salt, and pepper. Add 1 tablespoon of oil and mix with a fork — it will be the consistency of a crumbly paste. Pat the pork chops dry with paper towels, and then cover the chops on all sides with the spice rub. 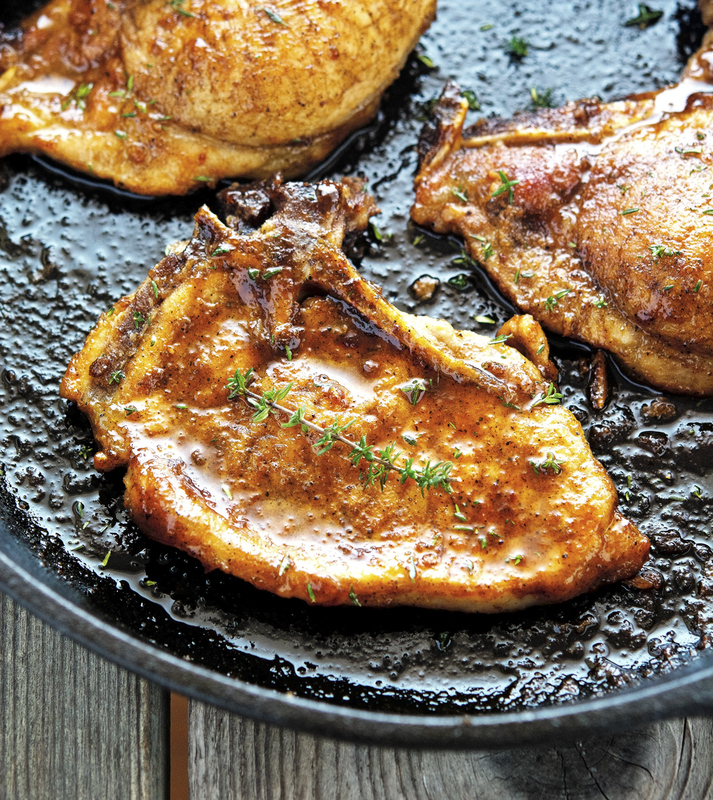 Heat the remaining tablespoon of olive oil in a large cast-iron skillet (or other oven-proof skillet) over medium-high heat. When sizzling, add pork chops and sear on both sides until golden, about 2 minutes per side. Place in the oven and roast for about 5 minutes. Remove pork chops from the oven, pour glaze over them, return in the oven and bake for further 5 minutes until caramelized. One serving yields 384 calories, 17 grams of fat, 30 grams of carbs, and 23 grams of protein. Sounds fantastic! And, looks amazing. Thanks Lauren, I hope you had a great start to the new year! They look fabulous, the glaze..omyyy. I get you, some months are just greens and then boom the craving hits. Hope you are having a wonderful 2016. The first pork chop recipe I ever made was The Pioneer Woman's pork chops with cinnamon apples and cheesy grits. It was delish. I'm craving pork, now! Sounds like a great recipe Jess, I need to check it out! You mention chili powder in the directions but its not on the ingredients list. How much chili powder ? I just fixed it. Thanks for letting me know! I am wondering if you meant to put chili powder in the recipe? You mention it in the text but not in the list of ingredients. Thanks it sounds great and I am putting it together right now. Though I must say - that glaze is pretty awesmazing! I'm glad you were craving red meat because these look fantastic! I go through fazes where I can't stop wanting all things beef, but I just make a few bacon cheeseburgers with portabello buns and guacamole, and that seems to do the trick! I think these beauties would suffice any meat craving. I love to use apple cider vinegar and this cooked down, all tangy and glazey, is that a word? Superb and those pictures? Incredible Mike. Glad you added that pinch of heat I would, too. My pork turned out a bit hard and sauce was a bit diluted. Did not manage to get the glazed effect. I was cooking for two portions so I just halved all the ingredients accordingly .any advice on what I may have done wrong?